While the war in Ukraine has raged on for more than a year, the growing conflict between the US-NATO and Russia has taken on new dimensions. From economic warfare waged by the West in the form of sanctions, to the diplomatic rows over the commemoration of Victory Day in Moscow, more and more it seems that relations between East and West are fraying beyond repair. Though it may seem that this conflict is escalating into simply an extension of what was once known as the Cold War, the potential exists for a hot war of global dimensions. 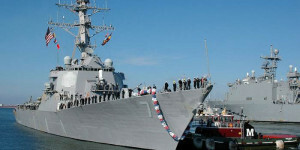 Additionally, and concurrent to these military exercises, is the planned Trident Joust 2015, which according to US Navy Admiral Mark Ferguson, will “test the capability of the NRF [NATO Response Force] command and control element to work at full operational capacity in a deployed location…TRIDENT JOUST 15…will reinforce the NATO Readiness Action Plan from the Wales Summit and project assurance measures to all NATO allies.” Trident Joust should be understood as an attempt to prepare NATO’s military architecture for possible rapid deployment in the Black Sea region, ostensibly as a defense against so-called Russian aggression while in reality seeking to expand NATO military capability against the backdrop of the war in Ukraine and increased tensions with Moscow.